“What made the mansion so exciting was its very emptiness and the lack of objects. the highest quality, however-this despite its location in the depths of the countryside. on Swedish style, his account of the Regnaholm restoration is inspiring. painted glass imitation of Porphyry in its borders. from the walls and wood detail that crept slowly over the original 18th century house. able to surmise furniture holdings of the original dwellers and carefully approximate them. Lars purchased the late Gustavian couches 20 years ago. a century ago with gilding, and awaiting restoration to their original finish. Stockholm cabinetmaker Olof Holm. Oh, how I love this bed! to preserve it, wall paper layer by wallpaper layer. 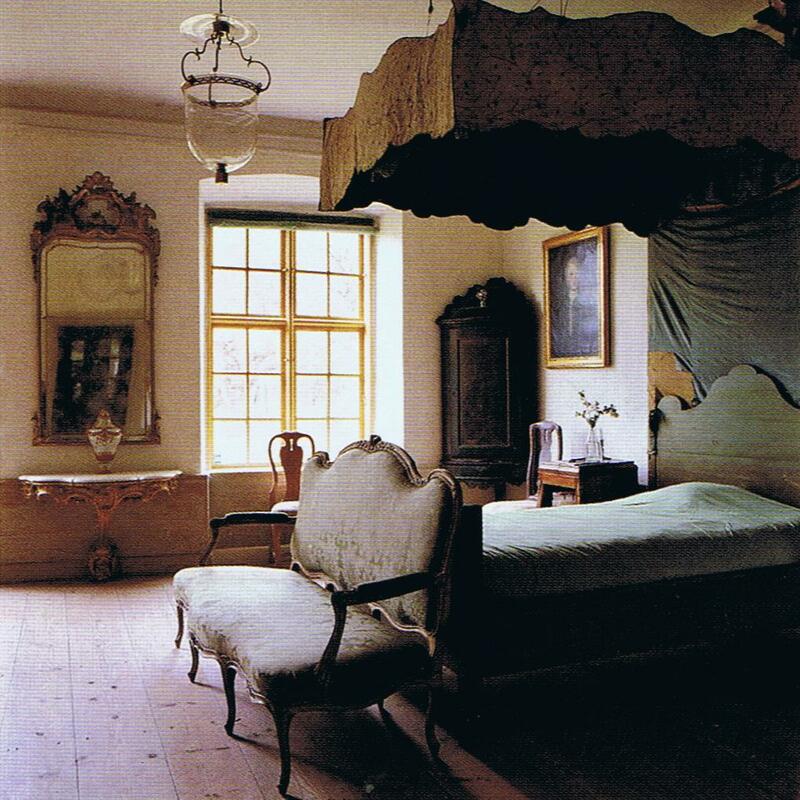 The Swedish style of the 18th century is such an elegant style! You have showed here very good pictures on which you really can see this! I adore the Swedish Style ! And thank you so much for the link to my post of Lars Sjöberg! Divine! I adore this Swedish style…but only in my dreams! I am afraid I am simply not an elegant girl. I shall visit Greet and see more of Lars Sjoberg. Thank you for sharing! Hi Laura. When I see the items that you find and treasure, I can tell you have the same sensitivity to the past that drives someone like Lars to preserve a beautiful part of his country’s past. Gorgeous and informative post. Not only do we get splendid images, but I always learn so much from your posts. Interesting to see the use of so much color ~ vibrant yet muted in that soft Swedish sort of way and quite different from so much of what we see of more modern Swedish interiors. 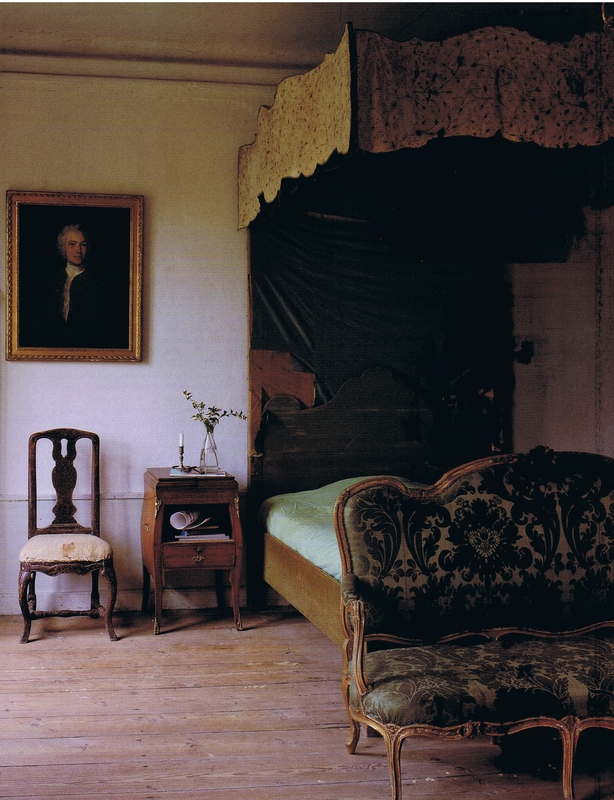 I also adore the Gustavian day bed and the layering of the mattresses reminds me of the “Princess and the Pea”. Hello all! I included link to Porphyry in case you’re dying to know what that is. 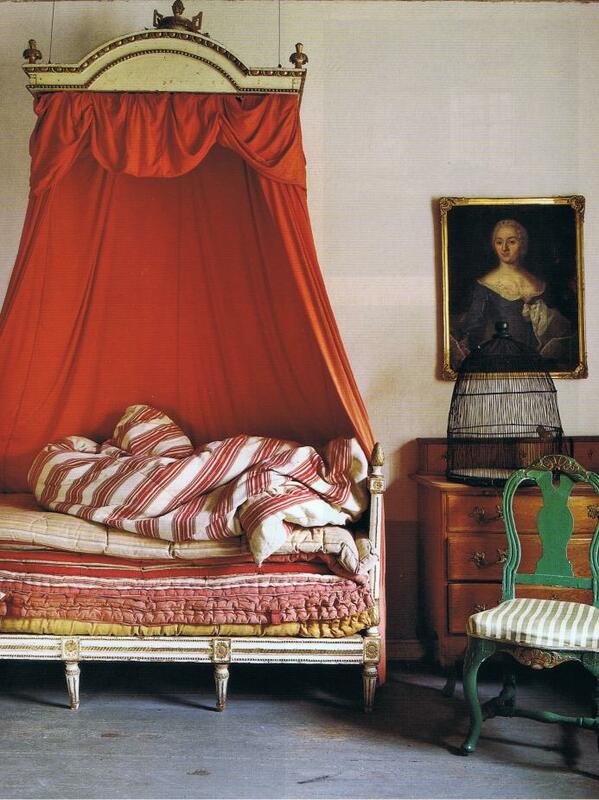 The daybed with red canopy was on the cover of World of Interiors. French Essence actually showed the cover on her blog, and was ruminating about how the cover influences our grab decision when choosing magazines. I rushed out and had to go to 3 bookstores before I could track this down (it was later in the month when magazines typically get pulled). The cover shot is a slightly redder red, glossy (and also includes a 2nd chair). Stokes my antique fabric/bed fetish. I would love to just wander through the rooms… So beautiful & those mattresses are perfection!! Thank you so much for stopping by my blog and leaving a comment! In doing so, I was able to discover your wondrous, beautiful blog! If you have no objections, I’d like to do a feature post on your blog. I think my readers would flip over your images! them into a fantastic home.